The need for yield isn’t changing – but ways to find it are. Term Deposit rates are very low and may go lower. However, the yield curve has steepened, so bond yields are higher. The current spread between TD rates and bond yields shouldn’t be ignored. Canstar’s best 3 or 6 month TD rate was 2.85%1, while a portfolio of 5 high-yield corporate bond XTBs was yielding 4.05%1. That’s a 42% increase over the best TD. Term Deposits may enjoy the benefit of protection under the Financial Claims Scheme. XTBs are exchange traded bonds units – currently a range of 48 securities traded on ASX. They give you access to individual corporate bond returns on ASX. Why can XTBs be compared to TDs if one is a bank account and the other securities? 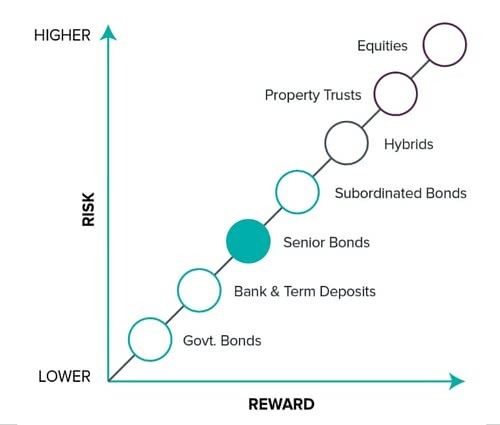 Corporate bonds sit just above TDs on the risk-return spectrum, they have similar risk propositions. They have very similar payout profiles: both involve a known amount being repaid, with known interest. Finally, both have interest and capital payments on fixed dates. View more about Term Deposits (TDs) vs XTBs. You don’t want to put your capital at risk, but you know you have to with equities and hybrids. This approach is acceptable for growth assets, but not for the defensive part of portfolios. Long-term volatility of equities was 15.7% p.a.2 and hybrids 5.7% p.a2. In contrast, volatility for investment grade bond issuers was 2.3%2 for fixed-rate and an ultra-low 0.6%2 for floating-rate. TDs have no volatility, so the trade-off decision to consider is “Does moving to higher-yielding XTBs stack-up in return for that small step up in volatility?” The 48 XTBs had yields up to the low 5s in early Feb 2017, and offer a wide range of choices to investors. A simple way to look at this is – with TDs you are lending money to a bank and are locked in for the term of the TD. With XTBs you lend money to an ASX100 company and can sell on ASX during the term. With XTBs you are effectively lending to a successful Australian company, such as Woolworths. When an XTB over a corporate bond matures – you get the face value of the XTB back ($100), having already received coupons along the way. This may sound obvious, but it’s fundamental. Volatility only matters if you sell early. XTBs cover 1–6 year corporate bonds and you choose the term when buying them. You can always trade on ASX if you want to realise your investment. This is where low volatility helps compared with equities & hybrids. Many people think of bond funds or ETFs as comparable with holding bonds individually, but they’re not. Bonds and XTBs mature – bond funds and ETFs are perpetual, just like shares. With bond funds and ETFs, you have to sell funds to realise your investment. Funds and ETFs have no capital repayment and income payments are unknown. Without the return of known capital, you are missing a fundamental feature of fixed income and the predictability that goes with it. A Fund Manager cannot tell you what their future income will be. They don’t know which bonds will be in the fund or ETF in the future, because maturing bonds will be replaced over time. Bond Funds and ETFs offer no capital return and no income predictability. This is at odds with fixed income, which is all about capital return and predictable income. With XTBs, you know the day you invest what their outcome will be: $100 capital plus known income over the life3. View more about Managed Funds and ETFs vs XTBs. Corporate bonds trade between banks and asset managers in $500,000 minimums. XTBs let everyone access the returns from individual bonds issued by ASX100 companies. Currently there are 48 XTBs on ASX covering bond issuers you know and trust. Names such as BHP, Lend Lease, NAB, Qantas, Telstra and Woolworths are available. Investors can also select between fixed and floating-rate coupon XTBs. XTBs come in $100 securities, so any investor can get exposure. Three XTB Starter Packs are available for investors to help you get started. Our Cash Flow Tool also allows you to visualise the income and capital from a portfolio of up to 10 XTBs. If you need stability of capital and predictability of income with returns above TDs, then XTBs are certainly worth a look. In addition to these top 5 reasons to look at corporate bonds, you can read more about the benefits of corporate bonds and XTBs in our insights. 1 Canstar and Australian Corporate Bond Company on 30 Jan 2017. 3 Assumes no issuer default. There have been two investment grade bond defaults in the last 30 years in Australia. Babcock & Brown in 2008 and Pasminco in 1995.